It was a time when Bengaluru was Bangalore and undoubtedly the heaven on earth. The entire image of the city was on a different scale and today’s Bengaluru is nowhere in comparison to the beauty of old Bengaluru. Everything was cool and calm with no traffic grievances and absolutely no much chaos. As the city grew and embraced the IT revolution, there was a drastic change in the way the city was contemplated at. Without commenting on the adverse effect of it, let us take a look at few awesome things about Bengaluru in the late 90s on today’s article. Anything beyond the trinity circle was considered as Bangalore airport. The localities of the airport were considered as a different land and newspapers used to separately carry the weather report of Bangalore and Bangalore airport. You will be amazed to know that the average temperature of Bangalore airport was 1-2 degree Celsius during the winter. Today, Yelahanka is the most crowded locality of Bengaluru but at that time it was not an integral part of Bangalore. The city almost ended near Mekhri circle. The area was so rich in flora that the entire stretch from Mekhri circle to Yelahanka was blessed with a row of banyan and tamarind trees. It was a booming period for Darshini culture. We had Vidyarthi Bhavan and a few Udupi hotels but when Upahara Darshini opened in DVG road, it became the hotspot for foodies. It is said that that on the very first day, they had served free Shavige bath to everyone. The concept of clean kitchen, hotel ambiance, and the usage of imported cooking utensils was all started there. Today, we have more than 5000 Darshinis and the way the city has developed is an incredible phenomenon. In the late 90’s, the outer ring road looked like a race track and people rarely went there. There was no signal in TIN Factory and the entire stretch from silk board to Tin Factory was like today’s Kengri – Magadi road. Empty and all empty! The astounding fact is that HAL ATC was visible from Maratahalli. So, in total there was no habitat in these parts of the city. Do you know how Bangalore was divided then? Anything south of JP Nagar was South Bangalore, anything west of Yeshwanthpur was an industrial area of Peenya and anything north of Mekhri circle or Hebbal was outskirts. It was a time when Bangalore was just 25% of today’s BBMP limits. Today, going to a pub is not a big news but in the 90’s it was a matter of status and pride no matter you consume alcohol or not. It was 1980’s when the pub culture entered Bangalore but it took off big time in 1990. Brigade road and MG Road were the primary areas where you could see pubs. Do you know the excitement of watching a movie of your favorite hero in a single screen theater? That crowd, fan screams, and all the chaos were the attributes of entertainment. Multiplexes have changed the way the movies were watched in the city but there is no match to single theater screen. There was a time when there were nearly 20 theaters between Mysore bank circle and Majestic bus stand. The popular theaters of that time were Alankar, Santosh, Movie Land, Menaka, Triveni, Majestic, Kapali, Sagar, Abhinay, Narthaki, Sapna, Geetha, Tribhuvan, and the epic Himalayas. Today, they are either closed or revamped to shopping complexes. Today, we have a hell lot of options to do in Bengaluru but at that time people used to enjoy all the little things they had an access to. Train ride in Cubbon park, Band stand in Lal Bagh, Joy Ice cream after the giant wheel, exploring NASA, Down town, and the blue fox was a few of the coolest activities people used to do on Sundays. How can one forget the joy of relishing Torino, bejos, rooafza, tutty fruity, Campo cola, and the Bomay mittai? Arun Ice creams, Baskin Robins and Kwality Walls were the favorite ice cream brands though. The Nilgiri pizza in Brigade road was popular during those days and Gobi Manchoori had just entered the city. Barton Center, Fifth Avenue, Raheja Arcade, and Alankar plaza were the places for budget shopping. The commercial street was the main attraction for east Bangaloreans and Safina plaza was famous and cool for holding the ‘25% off on Arrow Shirts’ sale. Also,Malleswaram 8th cross in North and Jayanagar 4th Block / Gandhi Bazaar in South were and are the favorite shopping hubs of Bangalore. It was 1990’s when Isckon temple’s construction had begun and if you remember there was a Dhobhi Ghaat located right next to it. There was a time when the city was known for severe criminal activities and Hi Bangalore was the local’s favorite crime newspaper. It was a time when we had red colored BTS buses and Double decker buses in few routes. Pushpak buses were known for luxury and Autos had an engine in the front seat. The favorite automobiles of that time were Premier Padmini, Chetak, Ambassador, Fiat, Maruti 800, Countess Cars when compared to Audi, and Lamborghini. Today the story is different as Indiranagar and Koramangala have developed in a way that just renting a 1 BHK home would cost you 8k – 10 k per month. However, in the 90’s they were very new layouts and used to flood a lot during rainy seasons. Coming to Whitefield, it was known only as a train station on the way to Chennai. As per the recent records, Mantri Pinnacle is currently the tallest building of Bangalore with a height of 153 meters and 46 floors. If we go back to 90’s then Utility building was the tallest of all and it was like Eiffel tower of Paris (could be seen from far off places). Today we have apartment and townships but at that time there were Vataras and Bangalore was known for them. It is a closed community with 7-8 houses with a single owner. There are a lot of Vatara stories to share. They were the coolest things of 90’s with wells instead of borewells in front of the house. South end circle was the traffic jam point of that time and till date it is. It was a big worry for South Bangaloreans but when compared to today’s traffic, it is nothing. Today’s stay in Bengaluru is horrible and if you wish to meet any of your friends then you need to pre-plan else you will be stuck in the long and slow moving traffic. Believe me, it was just 6-7 min ride from MG road to Jayanagar or Malleswaram during 90’s. People used to come home for lunch and they hardly carried lunch boxes. Those were the beautiful days where we had a chance to see a variety of birds habituating on the shore of these lakes. The areas like Madivala, Sarjapura, Agara, Tavarekere, Bommanahalli, Ulsoor, Hebba, and Nagaware are few names which were associated with wonderful lakes but now they are replaced with buildings and the worst traffic zones. 80’s and 90’s were the Golden times when it comes to city’s culture, language, tradition, and the heritage of art. Those were the times when traffic jams used to happen on the release of Dr. Rajkumar’s new movie and the theater was so alive. Today, we have Rangashankara and Raveendra Kalakshethra but 90’s has witnessed so many street dramas. Maya mruga which used to air on DD Chandana was everyone’s favorite. Orchestra was in full swing. Those days were truly magical and it is all bloody nostalgia now. Yes, with the economic conditions the prices have gone up but cost of living was way better then than today. Now, Bus No.600 is the longest BMTC route in Bangalore and the bus covers the longest 117 km’s with 157 bus stops. It starts at Banashankari TTMC and ends at Banashankari TTMC. However, way back in the 1990s, the longest route was Bus No. 1 from Yeshwanthpur to Jayanagar. Roads were not busy, there was no headache of traffic, and the city used to sleep at 9:30 but today people are still stuck in silk board traffic at 10:00 in the night. If you think that today’s Bengaluru is the coolest then you know nothing about the city’s weather. It used to be damn chilling and freaking cold at 10 in the night and temperature was nothing less than 10 – 11 degrees. So, this was a quick look at Nama Bengaluru in the late 90s and we are badly missing those days. If you have any memories about Bengaluru in the late 90s then please do share with us in the comments below. Get the best of Metrosaga delivered to your inbox. 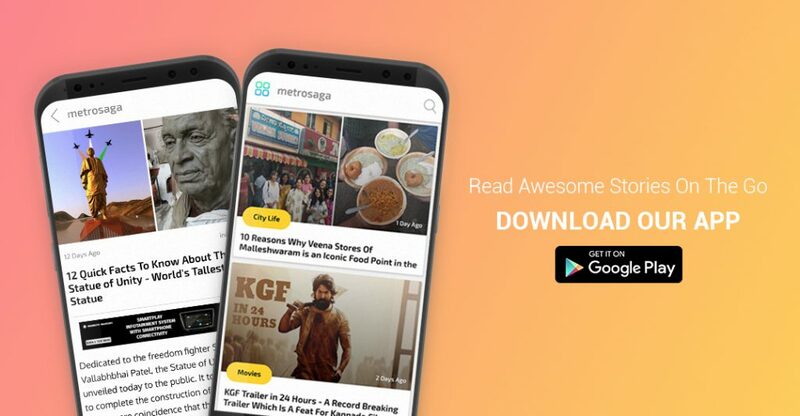 Subscribe to Metrosaga now and never miss an another update from us. We rode to school safely on bicycles and kept fit without needing to attend the gym (which by the way, were not heard of in Bangalore). We got the tyres on our bikes inflated for 10 paise per tyre by the old man sitting on the footpath. He was a reassuring sight as we went past him everyday… his simple tools of trade laid out neatly in front of him…..his ‘baandle’ of water in which he checked the tube for leaks when repairing a puncture and an old manual pump that wheezed as he pushed down on it. You can hardly see any children riding bicycles now. There just isn’t room on the roads for them. Those days one of the poshest restaurants was Princess on Brigade Road. And there was Udayavan Restaurant serving some fantastic South Indian fare. Mico Bosch was allocated space with a thought that Bangalore will not grow till there. Even today our Town Planning continue to be great visionaries. Visit Whitefield. If you can comment here implies you have access to internet. Please cross verify yourself that hindi is not a national language. In fact there is no national language in India. Its neither mentioned in constitution nor in anythe statute. You don’t have any right to tell anyone to leave India. And for your kind information you don’t get as tolerant as kannadigas anywhere else. We don’t hate Hindi or any language. If it is spoken everywhere doesn’t mean you can enforce any language on us. Its our choice. It hurts to see how Bangaluru has changed from green cover to concrete cover. It doesn’t feel like my home. The warm smiles have been replaced by impatience. I miss my Bengaluru of 90s so much.